I was looking at Penelope Walton-Rogers' illustrations of the Frankish/Kentish 4-brooch costume. She shows the underdress with the "keyhole" in the neckline extending to or past the waist, and held closed with a belt and the two upper brooches. At first, I wondered why on earth you would need a slash that long. None of our T-tunics ever go past the breastbone or so, just enough to get the dress on over your head. Then I thought: breastfeeding. With a gown like that, worn with a kaftan, breastfeeding would be trivial. Undo your top two brooches and bam, there it is. Makes me wonder if the primary purpose of the peplos dress/apron dress was to cover a centerline slit in the underdress. Pins are all well and good, but fabric gaps (particularly over curves) and in a cold northern climate, I can see wanting to put another layer over it. Undo a shoulder brooch, undo an undergown pin, and again, you're in the baby-feeding business. Better to give or to receive? The Pop-Up Mead Hall was not a great success. We were hardly in it at all; set-up and tear down were not awful, but not insignificant. We did entertain Lady Patricia for a bit! But most of the day was running around with the kid. It was definitely not worth the stress over trying to assemble the -bleeping- folding stool the night before. I think a minimal gear approach will work better in the future. I noticed many gentles came with just chairs or stools, and sometimes a third folding stool and a small platter. Unfold stool, rest platter, instant small table for cups and such! I should have brought the beanbag from Owlsherst. A&S entry paperwork needed lots of rocks. Had to leave before A&S entries got any feedback. 'Storvikmandius' was well-received! A few people got the reference and liked it. I was brought into court as the "wise woman." Since two fighter jets overflew just as Baron William was being accused of something, I made a reference to the ravens of Odin. Then Odin's other four ravens overflew during my recitation. We had a bit of a laugh at that. The kid was overall very well behaved. He required a lot of attention and didn't want to participate in children's activities, but aside from wanting to crawl into/under/around the barn, he was really good. He authorized! Aaaand then he got bored and wanted to leave. I left - he'd been very patient with Mom doing a lot of boring things that required him to stand still and be quiet (like sit through court) and I wanted his first real event to be a good time. A Scout version of the song as well as... the original? Why? Because I'm doing a Pages Academy class singalong on Saturday. 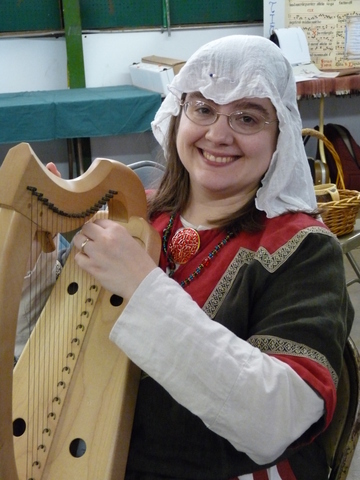 I'll teach one or two period rounds and/or songs, one or two traditional songs ("Rattlin' Bog" is a kid favorite) and one or two "SCA Appropriate" but wildly modern fun songs like "The Princess Pat." It's about a princess, right? I know a verse about Captain Jack, one about Star Trek and one about Superman. Two ain't SCA appropriate. I did a Children's Bardic probably two years ago, and I think I'd like to do another one at Novice. I run a children's bardic circle more like a campfire singalong and less like a bardic circle. We do have some young bards in Atlantia who could more than hold their own in the traditional "pick, pass or play" format, but not many. If a "children's bardic" is advertised, you're going to get a lot of kids who aren't necessarily ready to get up and sing. That's fine. I was a camp song leader. The Princess Pat, if you leave off the Star Trek and Superman verses. (The kids don't know who Capt. Kirk is anyway.) It's repeat-after-me, which is generally helpful. It's about a princess, which is vaguely SCA-related. Now Is the Month of Maying, especially if we do the repeats before the Fa las. That makes it a period repeat-after-me song. Rose or its documentable cousin, "Hey Ho Nobody Home." I like to do at least one round. Some version of The Rattling Bog. I learned a variant as a Scout first and as a Scadian later. It's "SCA appropriate" and kids love it. Wataliachee, Chester or another "action" song. Not period at all, but nothing blatantly modern in the lyrics and fun for the kids.